Our leaders are trained in responsible tourism matters and work to our detailed Responsible Tourism Policy. In Georgia, an increasingly popular area for hikers, they brief groups carefully to ensure that we have a minimal impact on the wilderness areas we hike through. To reduce plastic waste, we encourage the use of refillable water bottles with a built-in filter which is especially handy while hiking so we can make use of any refill points we come across. Georgian food and wine is also legendary and we support local producers, eating seasonally and locally produced food wherever possible which helps to cut down on food miles. 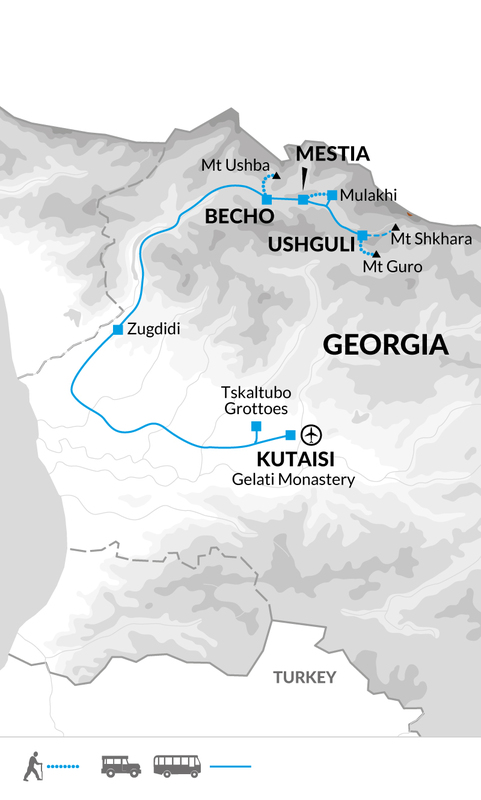 The area which this trip visits, Svaneti, is a remote part of Georgia with its own language and cultural traditions. Aside from agriculture, much of which is subsistence farming, tourism is one of the few opportunities for young Svans to make a living. Our visit helps to support the Georgian government's initiatives to encourage responsible tourism into the region, improve the region's infrastructure and reverse the previous depopulation trend. Throughout our time in Svaneti we stay in family-run guesthouses that are both part of and built alongside family homes. We employ local guides to accompany our hikes and Svan drivers are used to reach the isolated village of Ushguli. As well as allowing a genuine insight into the lives of local people our visit is thus helping generate much needed income for the community. In Georgia we are also working with the German government organisation ‘GIZ’ to help our partners train locals further down the supply train – from guides and drivers to hoteliers and restaurant owners. This helps to professionalise the industry in Georgia at a local level and benefits all businesses that we interact with.